Seamlessly transfer data into your CRM tool. Always have the most up-to-date info. 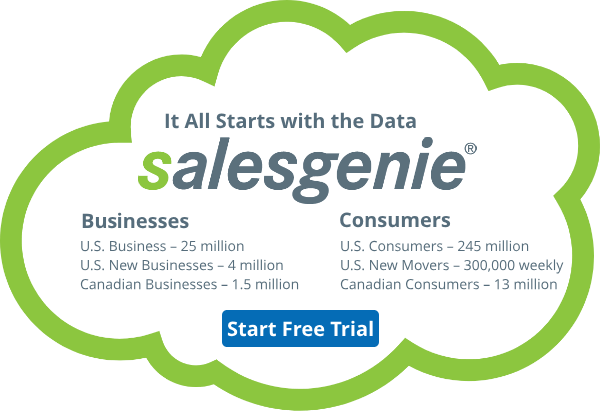 Salesgenie Dialer lets you easily call your business leads, view company details, and create notes and follow-ups - all with the click of a button. Stay connected to the best sales leads and lead management tools on the go. We make it easy for you. Simply upload your own creative, or let us design one. Increase your email open and response rates. Ability to onboard offline data to serve ads on frequented websites. Appear in top search engine results. "Salesgenie has proven to be a valuable tool in our B2B divisions. With the lead generation and reporting/tracking tools, our sales pipeline is managed far more efficiently and our sales team is more productive." "It was a pleasure working with InfoUSA; very easy to communicate with and always quick to answer any questions. They clearly strive to make the purchasing process as streamlined as possible and ensure their clients are pleased with their services." "The representatives were courteous and knowledgeable. They were attentive to my needs and questions"
"We have worked with Salesgenie for many years. We have tried other lead sources, but Salesgenie and our rep Brian Jorgensen have been an integral part of our winning team. Ease of accessing our specialized lead parameters are unparalleled with any other lead source we have tried to date. Thanks, Salesgenie, for always having our back!" © 2019 Salesgenie, from InfoGroup Inc. All rights reserved.